‘All I Need’ LP, album art by Miss Lana Rebel herself. I usually only present to you here oldschool vintage vinyl, but I’m making an exception for this newly released, yet instantly timeless album. The music of Miss Rebel is so inline with my nostalgic old-western mindset as of late, that this record literally hasn’t left my turntable in the couple weeks since I’ve owned it – with the exception of flipping it from A side to B side and back. It wasn’t really coincidence that I was horribly hung-over when I first listened to this record (I had purchased it from Lana the night before at the peak of my high on Total Fest), but upon hearing the hung-over heartache in her own lonely voice, it couldn’t have been more appropriate that I was. When you listen to this record, if you’re not awakening squint-eyed and melancholic to the Sunday afternoon sun, you just might yearn to be; Lana’s languid and lulling cowgirl crooning provides a sentimental comfort in the blues. The album itself is a collector’s item. Only 208 LPs were printed, each numbered and autographed. The beautiful album art was created by Lana herself, and is complete with a handcrafted lyric sheet, full of even more hand-drawn rustic cowboy scenes. From the raw paperboard construction to the hand-stamped spines, this album has a unique DIY, yet very professional flavor. 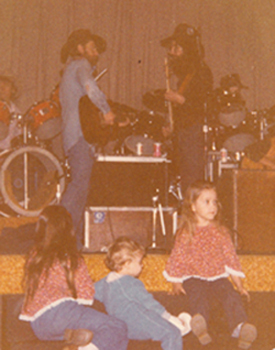 Little Lana, her sister and cousin at a rehearsal for Honeysuckle Rose. My dad was a crew member during the filming of Honeysuckle Rose. My first trip on an airplane took us out to Austin for a few weeks where we stayed with Dad at the hotel, and got to meet the band and cast. Pretty neat. I remember dancin on my dad’s feet at that rehearsal. And Paul English riding up on his motorcycle. They were teaching Amy Irving some of the songs for the film. Everyone was so sweet to us. I remember my mom being really happy about how humble they all were, and kind to the crew families. A virtue that I can certainly apreciate now that I’m grown up. Thanks Willie and Family! Thanks, Mom and Dad! 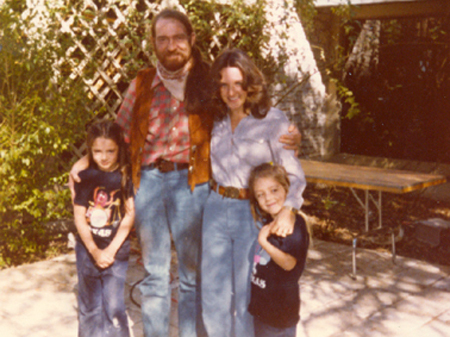 Little Lana, sister, mom, and Willie. Excellent classic country sound. Willie Nelson has had a LOT of impact on us all! And have I mentioned that I’m listening to George Jones a lot these days? And, finally, may I suggest having a listen to Paul Burch, a neotraditionalist country/soul writer and singer out of Nashville? Muchas gracias for the informative, kind words. I think what drew me most to this record was its immediate timelessness, and in an age of hyperbole, this may seem like a b.s. sales pitch, but I honestly believe this record will be one of the things that my little label is remembered for.